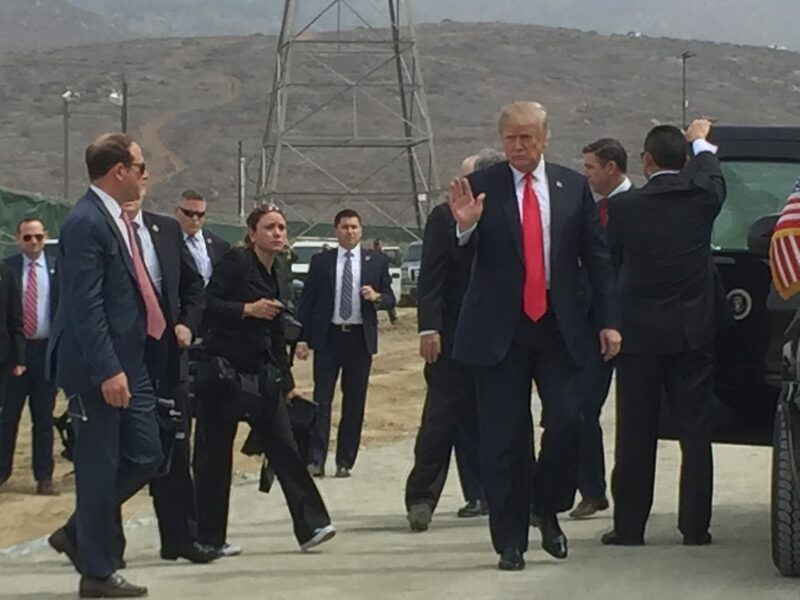 OTAY MESA, California — President Donald Trump arrived at the U.S.-Mexico border early Tuesday afternoon to inspect the eight prototypes for the border wall he promised to build. It was the president’s first stop on his first visit to California since taking office, and came just days after the Department of Justice filed a lawsuit in Sacramento challenging the constitutionality of the state’s “sanctuary” laws. 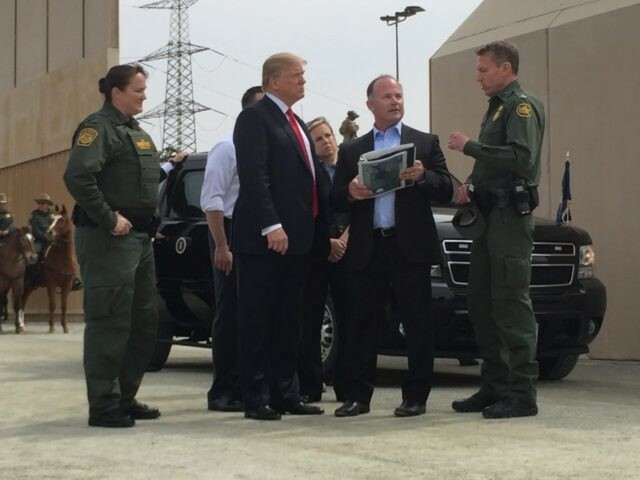 Trump was accompanied by Department of Homeland Security Secretary Kirstjen Nielsen, and escorted by Chief Patrol Agent Rodney S. Scott, who oversees the San Diego sector of the border. He was also briefed by Jim O’Louhghlin, an official who works with the contractors and is considered the “subject matter expert” on the wall. Two of the eight prototypes, each 30 feet tall, have see-through fencing, both at ground level. He also said that he preferred models that had a rounded top that would make scaling the wall more difficult. 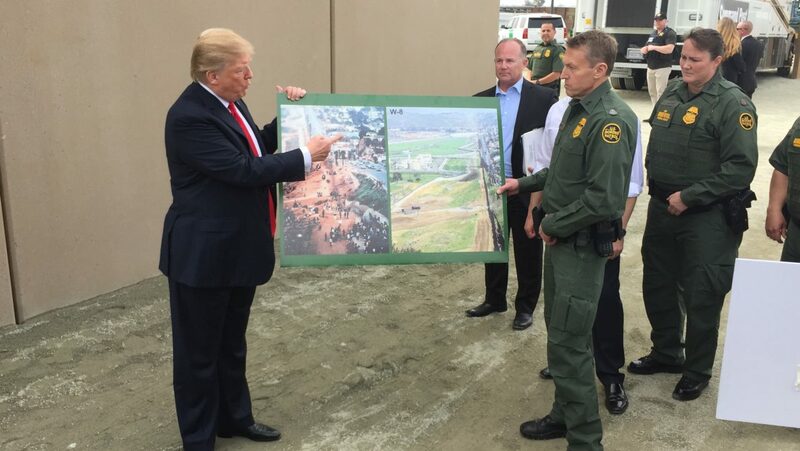 Trump added that a fence, by itself, was insufficient because it could be easily cut. “You have hundreds of holes cut in, and patched,” he said, referring to the current barrier. 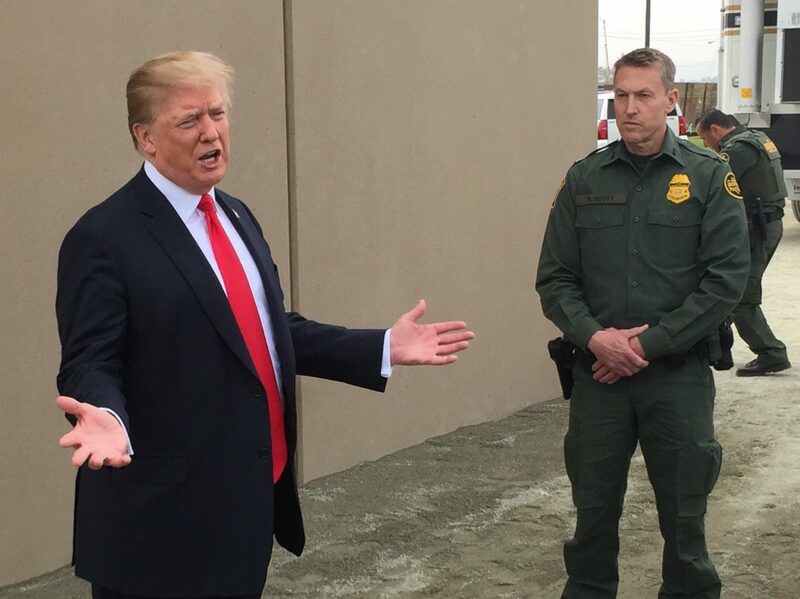 “If you don’t have a wall system, you’re not going to have a country,” he said. 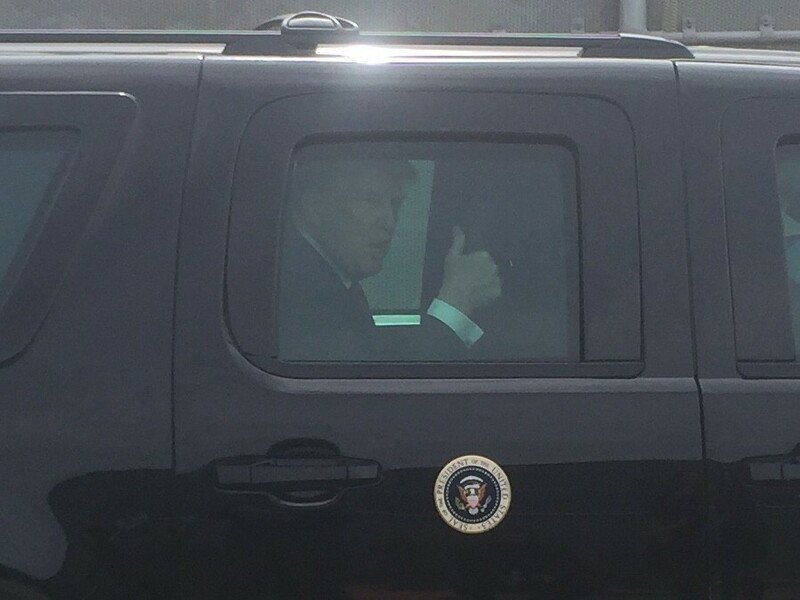 “The governor is doing a terrible job,” Trump said, standing by one of the prototypes, citing high taxes, illegal immigration, and the exodus of taxpayers from the state. 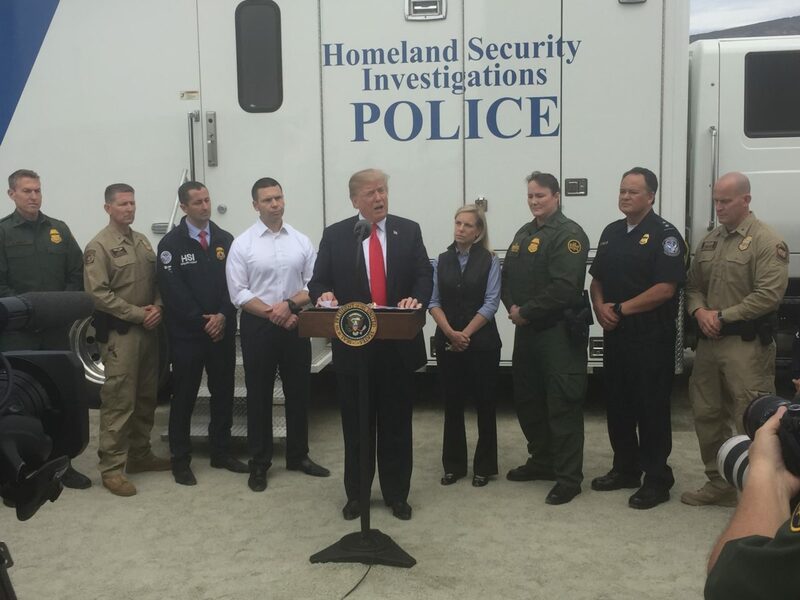 He also singled out Oakland Mayor Libby Schaaf for warning illegal aliens last month that Immigration and Customs Enforcement (ICE) would be conducting a sweep in Northern California. He called on Congress to “fully fund” the wall, no matter which prototype, or prototypes, were chosen. 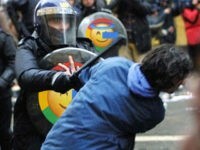 “The ones that work the best aren’t necessarily the most expensive. I like that ring,” he concluded. 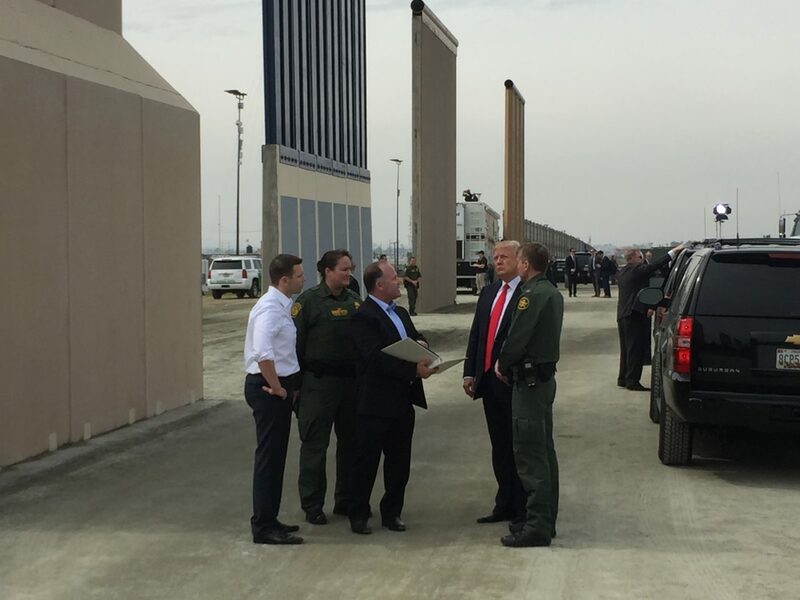 The wall prototypes were constructed pursuant to an Executive Order issued on President Trump’s fifth day in office. Long before the president arrived, demonstrators — for and against — prepared to greet him. 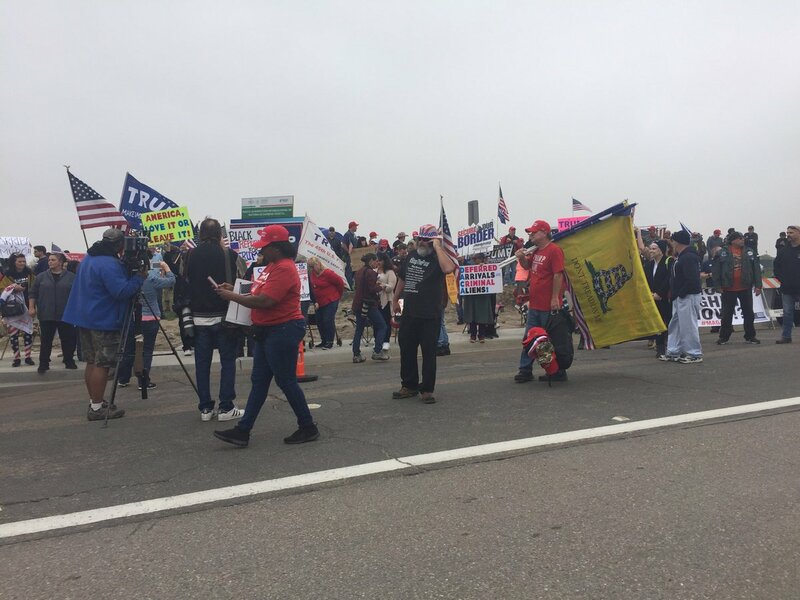 Several hundred pro-Trump, pro-border wall protesters gathered near the Border Patrol station, waving Gadsden flags and Trump campaign banners. 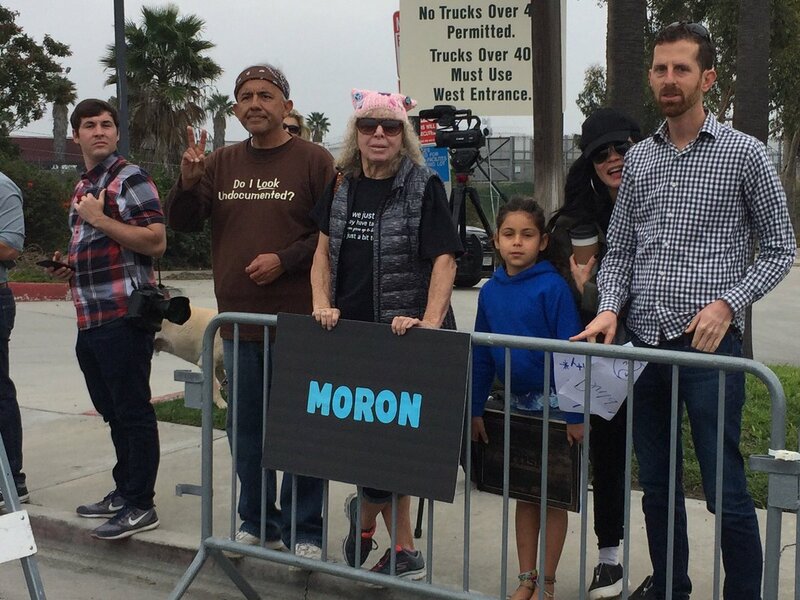 They carried signs supporting the wall and opposing California’s “sanctuary state” laws. One sign read, in Spanish, “Arriba el Muro” (Up with the Wall). Earlier, Breitbart News spoke to some of the organizers of the demonstration. 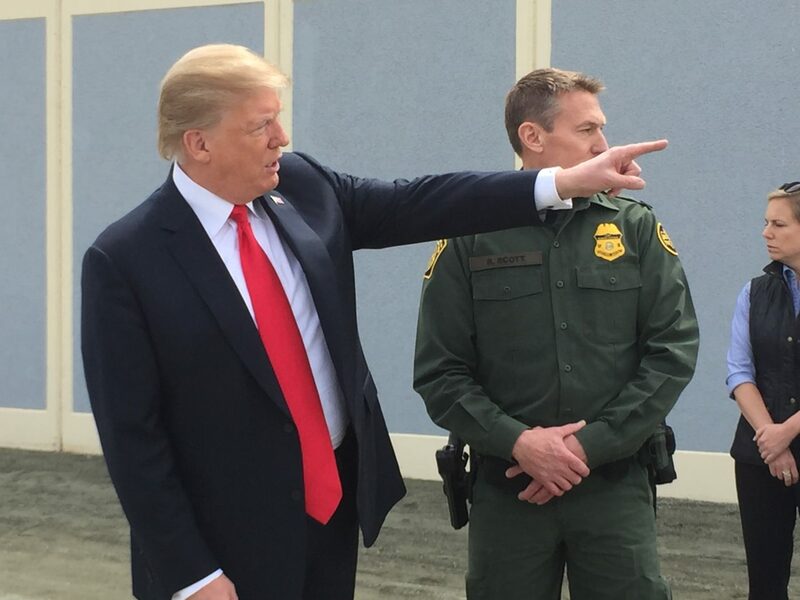 Ben Bergquam, co-founder of www.FightSanctuaryState.com, told Breitbart News: “I am excited for President Trump to visit the wall prototypes. We are sick and tired of our dreams being stolen by illegal sanctuary policies and the criminal politicians that support them in our state. “I have friends who have lost children at the hands of illegal aliens that were protected by sanctuary policies, yet all we hear from the left are stories about poor illegals. 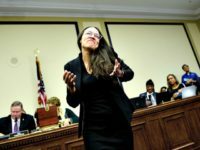 What is it going to take for Democrats to care about American citizens’ dreams again? 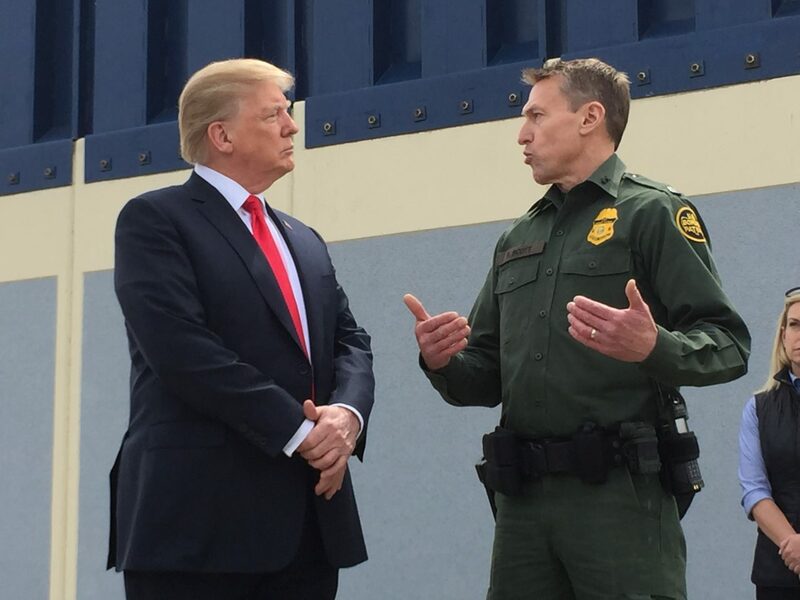 Jeff Schwilk, Founder of San Diegans for Secure Borders, told Breitbart News Tonight on Monday evening: “We know we had to come out and show support for President Trump, because we represent the majority, not these paid activists and radical freaks that run around doing their radical protests. Closer to the prototype site itself, a couple dozen anti-Trump protesters gathered, holding signs of their own. “Traitor,” said one. 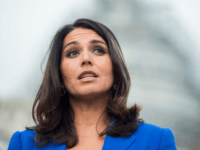 “Moron,” said another — a reference to Secretary of State Rex Tillerson, who reportedly used that term to describe President Trump last year, and who was abruptly fired earlier Tuesday morning. 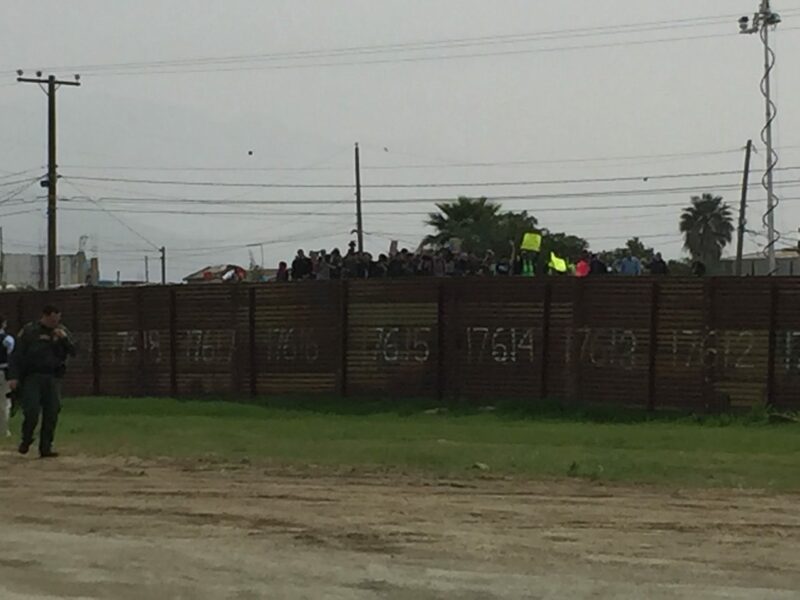 Throughout the president’s visit to the border, protesters and journalists watched from rooftops on the Mexican side of the existing border fence — under the watchful eye of police on both sides. Later Tuesday, the president was set to deliver a speech at Marine Corps Air Station Miramar before flying to Los Angeles and attending a Republican fundraiser at a private residence.